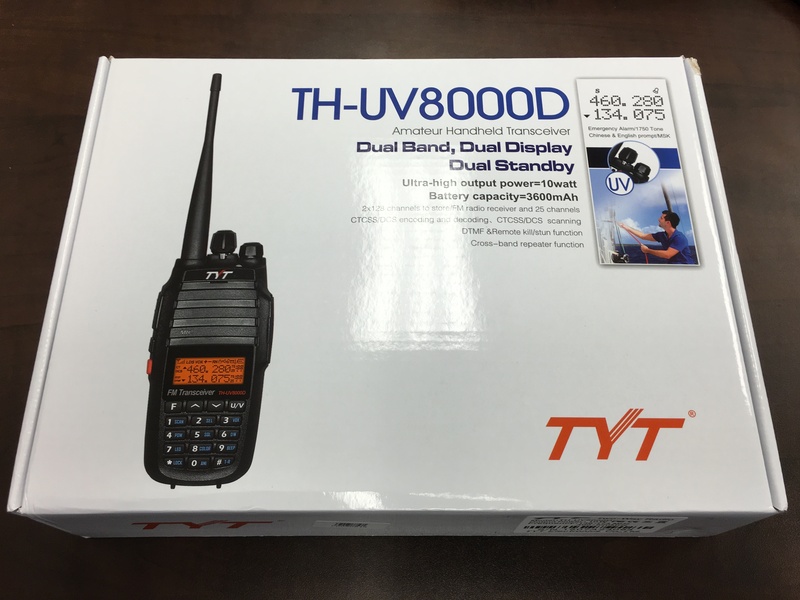 Thanks to KB4RMA ordering a 2-pack of these I have a new radio to test, a TYT TH-UV8000D. The radio is a 10w/5w VHF/UHF with all of the normal features you see on the Chinese HT’s. Here’s a few pictures and initial thoughts. 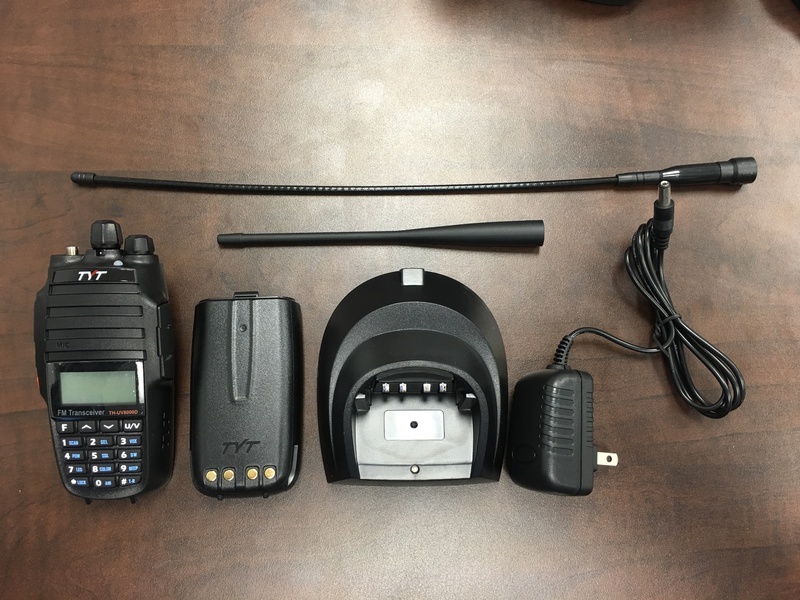 The radio comes with the usual battery, charger base, charger power supply, belt clip, and antenna however TYT also includes a high-gain antenna as well. I’ll be interested to see how both perform and check out on the meter since so many of the Chinese HT’s ship with terrible antennas. I have a Nagoya VHF/UHF antenna I can use to compare the included high-gain antenna with in real world use. The battery is listed as 7.2v 3600mAh which makes it a 2-cell configuration and just judging by the weight I would say they haven’t embellished on the battery’s stats at all. 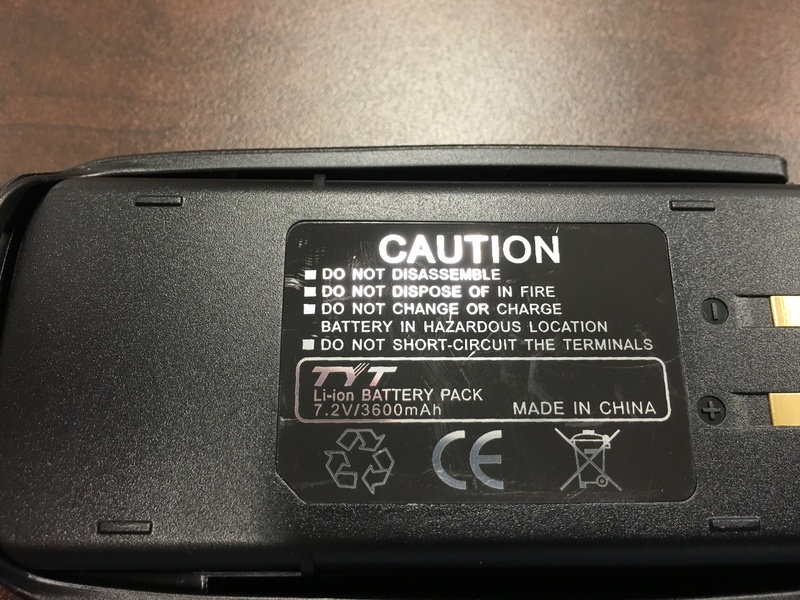 Good news on the charger base and power supply also. 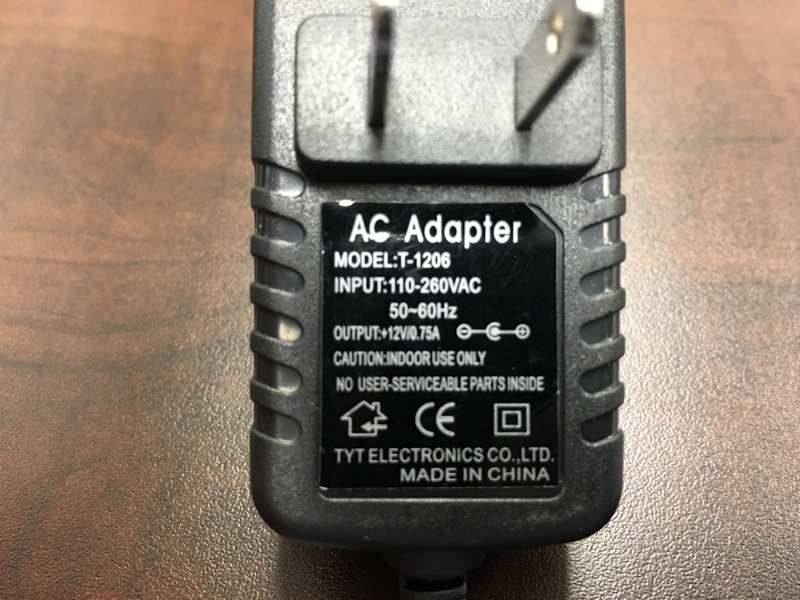 The base lists it’s required voltage at 13.8v DC however the power supply is rated at 12v DC. This tells me that the charger IC inside the base can handle a range between 12v DC and 13.8v DC allowing this radio to be charged from multiple sources. 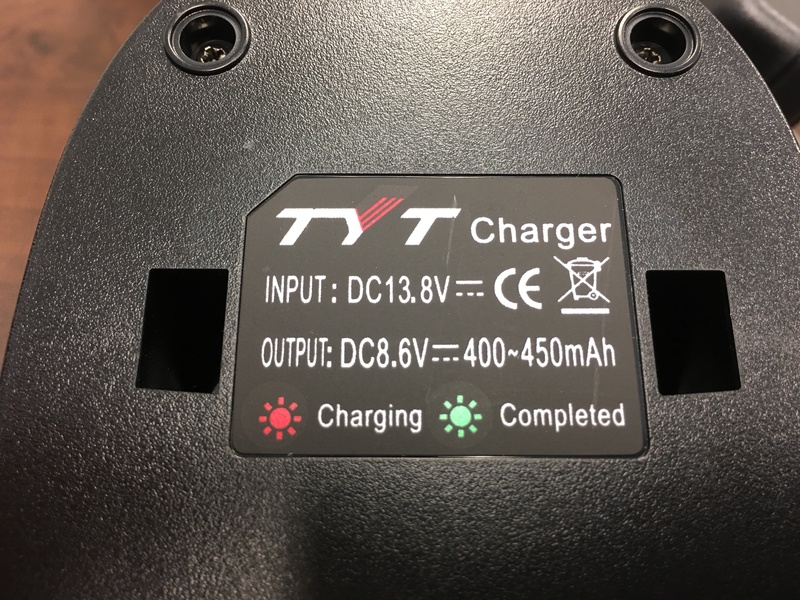 Much like my AnyTone TERMN-8R it can be charged from the included power supply, vehicle DC, bench power supply, or by battery. Programming software is very similar to the other TYT software and works fine however lacks ease of use abilities such as copy and paste and the ability to insert or delete rows. Building a program is easy however editing one is a pain without these functions. I haven’t tested it yet but I’m willing to be it will be easier to build the frequency load in a spreadsheet and import via CSV into the TYT software. Programming through the radio itself is also straight forward and actually very easy. 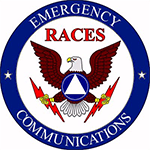 If you can program a Yaesu or Icom HT you’ll find this TYT easy to program. The menu system is standard across most all radios and has no evident first-use flaws that I’ve seen. The only complaint I have so far is the lack of being able to quickly change the TX power level. It’s only a few more keystrokes through the menu however I prefer to have a dedicated Hi/Low button on the keypad especially since this is a 10w/5w radio. Next will be the real world use. I don’t yet have the equipment to verify the output on a scope so I’ll just have to rely on a couple of weeks worth of use and reports from those I QSO with. I’ll be back in around two weeks with a performance evaluation. How did testing of this HT turn out? The radio is a great little HT. 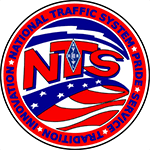 All audio and signal reports have been favorable, the speaker is crisp, clear, and plenty loud, and programming is simple just like all the other Chinese/Kenwood/Yaesu clones. The only negative thing I have run into is that the rotary encoder knob on top is hit or miss when it comes to changing channels or frequencies with it. Some times each “click” will be a channel but some will take an extra turn to change the channel. Seems to be that the rotary encoder may have more steps than the software is looking for. Other than that little issue it has been a great and reliable HT. 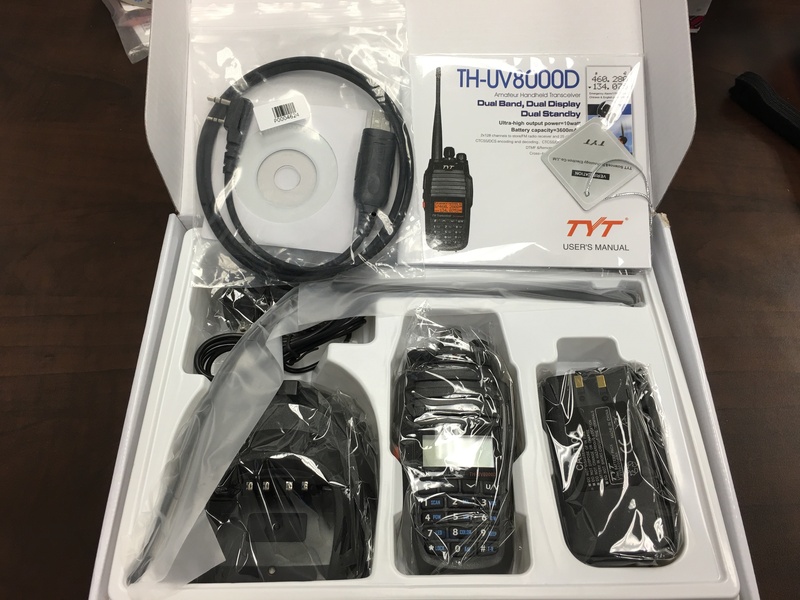 Many of the online sellers of the TYT TH-UV8000D are currently unloading the older versions that don’t do cross-band repeat (even though the box says it comes with cross-band repeat as a function). V3 of the radios allowed you to turn on Menu 11 (but didn’t actually do anything), V4 of the radio actually works in cross-band repeat mode (once Menu 11 is set to “ON”). 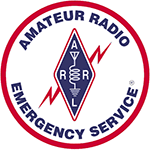 Beware, however, as once Menu 11 (on the V4 radios) is set to “ON”, any VHF/UHF programmed memory setting on the radio will continue to cross-band repeat (in other words, you can’t simply set up one existing memory to cross-band and that’s all, any existing VHF shown on the display will continue to cross-band to any existing UHF frequency until you turn off Menu 11). Of course if you don’t want the cross-band repeat function and a few other new firmware tweaks, a V3 TH-UV8000D may do very well for your needs. I do recommend (regardless of which version radio you select), looking at the RT Systems programming software/cable kit and a spare 3600 mAh extended battery, both now available on Amazon. Had any problems with it overheating and shutting off? Had mine about a week and happened twice. Haven’t had it shut off but it does get warm when talking for a good amount of time. So far no operational issues with it however. I have been trying to figure out how to enable the crossband func since I want to use this HT primary for FM Satellites. any idea how to do that.